Seeing as how we have some knife aficionados on this part of the forum, I had some questions on basic knife maintenance. I purchased a Blackhawk Gideon Drop Point Knife for camping/field work a while back, and now that the weather is warmer I've had the chance to take it out and use it (cutting rope, wood carving/kindling, wood chopping). It has a 5" blade made of AUS8A stainless steel. Now I know many knife "experts" will say that stainless steel, in general, is not the preferred blade material for bushcraft and camp duties, and that carbon-steel 1095 type material is better for that application due to its toughness and ability to sharpen quickly. At first, I was pretty intent on getting something like an ESEE 6P-B, but when I saw the Blackhawk Gideon for $98 I couldn't pass up that deal. And while I haven't put this knife through extensive use/abuse just yet, it has worked fine and held up well in everything I have used it for (including batoning wood). 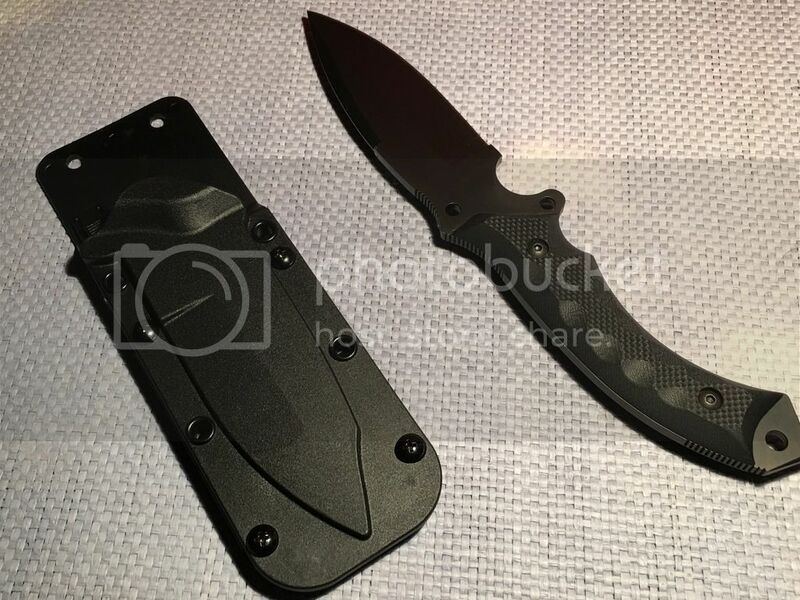 My main gripe is that the back edge has a limited flat edge for batoning and cutting wood, but given that this is a tactical knife more than anything else I can't be too critical of that. Truth to be told, this thing is quite capable of batoning most small branches and deadfall that I find on the ground, which is likely all that I'll ever need from a knife. 1) AUS8A stainless steel supposedly has a high corrosion resistance and so far I haven't seen any signs of rust. What should I use to clean and protect the blade over the long run? So far, I've just been using some simple rifle CLP (basic lubricant/cleaner) to do a quick clean after use. 2) The blade has retained its edge so far, even despite the batoning. What tool should I get to resharpen the blade when it inevitably dulls? 3) Anyone have recommendations on a better way to strap my sheath to my belt. I'd prefer to wear the knife so that the blade lies in the small of my back and parallel to the ground, as opposed to how I wear it now, which is blade down, perpendicular to the ground. I really can't adjust how the stock sheath sits due to the fact that it can only be set up one way. Anyone have recommendations on aftermarket sheaths, or popular tricks for rigging up a custom sheath attachment (maybe with paracord)? 1) There are a bunch of different products and recommendations for taking care of a knife. My way is very simple. Clean it with soap if it is really nasty then coat with olive oil. If not then just wipe down with a paper towel with olive oil on it. I always wind up cutting food with my knife when camping and do not want to be ingesting WD-40, CLP, silicon, Teflon, etc. 2) There are a million answers to this one as well. I recently made a strop to keep a nice edge on my knives. You can buy them online. Flexx makes some nice ones. Only have to get the stones pit after really beating on the blade. 3) I personally think the vertical strong hip carry is the best carry for me. Hard to tell from the photo but looks like your sheath has a clip that can be unscrewed and leave just the sheath with holes in it. If that's the case it is easy to run 550 cord in a crisscross thru the holes and run your belt thru that to carry it horizontal. There are plenty of sheath makers out there. If you are handy then it doesn't take too much to get the stuff to make your own out of kydex. 1) Tuf Cloth is a great rust preventative as well as the others mentioned. I like mineral oil, personally. 2) I have the Spyderco Sharpmaker, but there are some other really great tools if you don't want to free-hand sharpen. A strop is a great way to remove a wire edge or keep the edge touched up. I don't recommend carbide sharpeners. 3) You can get a custom sheath made, of course. You can secure the lower portion of the sheath to your leg, but it may interfere with sitting/rising quickly. Personally, I like "scout carry" (small of back) if you have to sit and move around a lot. This is, perhaps, the most personal decision to make, as it is based on your body, your preference, and your activity. I've carried Tom Brown Trackers, ESEE 6, and other big knives in various ways - different knives and sheaths carry differently (comfort/access/retention), too. Thanks for the responses! Olive oil and mineral oil are two obvious options for cleaning/lubrication that I never even considered until now. RememberTheFallen, what do you mean by "alarming" carry? BTW, the backing plates do unscrew, so yes it is possible to run 550 cord through the holes...I'll have to fiddle around with that and maybe check out some designs, tips online seeing as that I'm nothing special with knots and 550 cord. My IPad has been screwing up and the autocorrect is going crazy. I am not sure what word I was trying to type but it was not alarming. Fixed it. Mainly just meant strong side is how I carry. The cools thing about rigging it in an X is that you can carry either vertical or horizontal depending which way you route your belt. If its a user knife, just wipe it off & put it away. Repeat as needed. If you frequently strop, your sharpening will rarely be needed. I strop on a leather wheel every week or so. Takes about 10 seconds. To actually sharpen, sort of depends just how dull its become. I have a couple diamond plates for the most part thats all needed. If I take on a blade whats really far gone, I initially sharpen on wet sandpaper backed onto a hard surface, then work up to diamonds then strop. I have a surface level understanding of the different blade materials and had heard that carbon steel (like 1095) was preferred in the more "outdoorsy" knives. Do you disagree with that? Just curious to hear your take on it. Check out Bud Nealy MCS sheaths. Maybe it will give you some ideas how to use your sheath horizontally. I caught the knife bug a few years back. I started making some sheaths out of kydex for fun. It wasn't too expensive to get into. With basic skills I think you could modify your existing sheath to mimic some of Bud Nealy's sheaths. I'm getting ready to figure out how to attach my Bud Nealy to my jackass should rig for my glock.